Have been quite and adventure. Apologies for the delay between posts. As you can imagine the last couple weeks have been hectic with the end of work, and final preparations for the journey. Well, the preparations are over, and the journey has begun. I am currently, sitting on the plane from Dubai to Kathmandu, where I will spend the evening before making my way to Surkhet. The journey began Sunday on a very sleepy Sunday morning, September 16th. The night before my trip was rather sleepless, and I could not stop from thinking about everything and anything that I might not have taken care of our packed. At 8am my sister came to pick me up, and drive me out to Dulles, but on the way, we saved sometime for Georgetown Bagelry, and one last Bacon, Egg, and Cheese on an everything bagel. While, the bagel was delicious, I learned while eating that you are expected to arrive two hours early for international flights. Thankfully we had saved some time, however, I was the very last person to check in for the flight. The flight went great, and was virtually empty. I had a full row to myself for the 13 hour flight, so there was plenty of room to watch movies, read my book, and nap. If anyone ever flies to Dubai, I would suggest Emirates Air, it was a pretty stellar experience. We landed in Dubai at 715am Monday morning. After making my way through customs, I couldn’t help but notice the traditional attire of many men and woman at the airport. Having never been to the Arab world, it was quite interesting to observe some of the cultural differences. That being said, beyond the attire, I quickly realized, that Dubai is a very western city. Everywhere I looked I could see American influence, whether looking at food, movies, stores, hotels, etc. Speaking of hotels, I checked into a palacial room at the Marriott Dubai Marina. 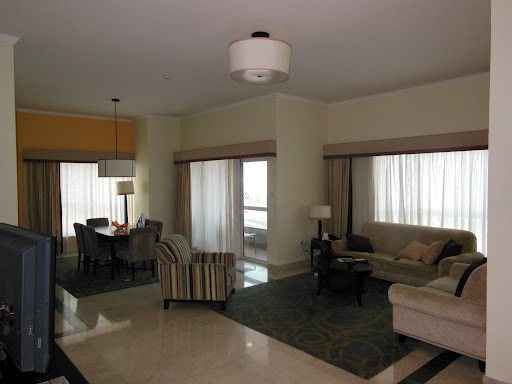 With 3 bedrooms, living room, dining room and kitchen! After checking out the room, and grabbing a quick bite I took a much needed nap to give me energy of the remainder of the day. Following the nap, I took a cab down to the mall of Dubai. According to the information I read while walking around the mall, it is now the world’s largest. I walked the mall for a few hours, checking out the sites, including their giant indoor aquarium, and skating rink…The Dubai mall is part of the “Downtown Dubai” complex, with the Burj Khalifa its center piece. 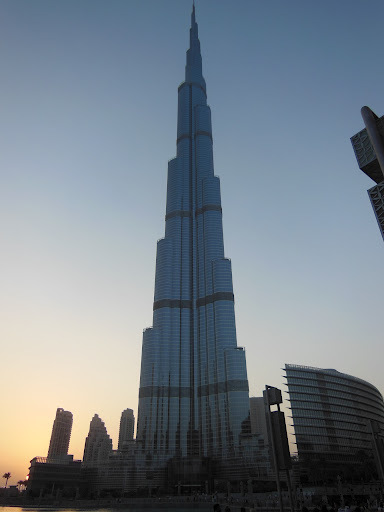 After checking out the mall, I went down to the Burj Khalifa to check out the “top of the world experience” . The emirates had built an entire experience around the building, so I learned a ton and enjoyed myself quite a bit in the process. Following my tour of the Burj, I made myway down to the base of the bulding for the 6 pm fountain show. Dubai boasts that this display is the largest in the world, surpassing those even in Vegas…Speaking of fountains, the best fountain was actually in the lobby of the Burj al Arab, where I went for drinks Monday evening. The world’s only “7 star” hotel was quite a wonder. I made reservations well in advance, and got to enjoy some $40 USD cocktails. Walked around the hotel, and saw everything that was allowed. Following the Burj al Arab, I went to the observatory restaurant of the 52nd floor of my hotel, which had an amazing view of the Palm Jumeriah. After dinner, and a Peroni, I made my way down to my room and went to bed, in preparation for a long Tuesday. That brings me to today. I woke up this morning, at 8am and packed my bags for the airport. I can’t help but notice one issue with my bag is that I need to take out everything to get to some of the stuff I need, so the packing process took a bit longer than expected. I jumped in a taxi and made my way down to Dubai International for my 1220 flight on Fly Dubai. Unfortunately this plane doesn’t have wifi, so this entry will come a bit belated! That said, I hope everyone is great at home, and I’ll be sure to write more about tonight’s adventure in Kathmandu.